Earth's End: The Dharma Punks goes international with US/UK and French editions! The Dharma Punks goes international with US/UK and French editions! After a hugely successful launch in New Zealand last October, Ant Sang's The Dharma Punks has been in high demand - flying off shelves locally and attracting international attention and demand for it to be more widely available. Here at Earth's End we are very pleased to announce that thanks to the Nicolas Grivel Agency the foreign rights for North America/UK and French editions of The Dharma Punks have been secured. 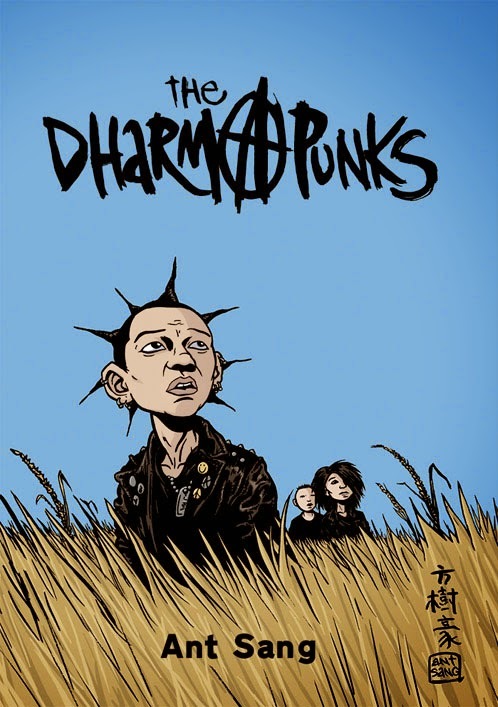 Conundrum Press International have announced they will release The Dharma Punks in North America and the UK in trade paperback in September 2015 for $25 US. For more information you can read their official press release HERE. We can also reveal the international rights for a French language edition have been secured by Presque Lune, a fine French publishing house whose website you can visit HERE. Currently in production, a release date has yet to be confirmed. Ant Sang recently returned from attending the Taipei International Book Fair, where he was also taking part in a graphic novelist residential exchange between Taiwan and New Zealand. The opportunity for his work to be widely available to an international audience means a great deal to Sang, "I'm really excited about the upcoming release in the US, UK and France. Since the Kickstarter campaign, things have happened surprisingly quickly - and it's great Dharma Punks is reaching an international audience after all these years." Both editions will also feature a new introduction from Dylan Horrocks, author of the recent internationally acclaimed graphic novel, Sam Zabel and the Magic Pen. Stay tuned for more news and forthcoming announcements from Earth's End Publishing, in the coming weeks.